It was Kea time again… indeed, it was his second outing this year following on from Listener 4226, Polar, where five words had to be replaced by rhyming synonyms. Here, some (as seems normal these days, we weren’t told how many) had one or two letters removed before entry to make the word or name to be entered. These letters would give thematic items, and letters would need moving around in the completed grid. I expected the clues to be pretty tough, so was pleasantly surprised to get about ten on my first pass through. Obviously these were at the easier end of the spectrum, and included NORIAS, TEHRAN (THE* + [I]RAN), BASRA (S in ARAB<) and RENNES (BARRENNESS – BARS). There seemed to be an awful lot of geography in Kea’s clues this time. Still, it made a change from the alcoholic fog that Shirley assumes most Listener setters spend their days in. I’m not too sure how long it took for me to finish the grid, but it was a good four plus hours. Luckily, I was on top of Christmas preparations, so I managed it in only a couple of sessions without shopping distractions. All I’ll do this week is highlight my favourite clue and a few devilish ones… I won’t say which is which! AND in PAR; mackerel = pimp! And so, the end game. The letters dropped from answers before entry were as on the right. It didn’t take this Englishman very long to see LAPSANG, which I’d obviously heard of, followed by TWANKAY, which I hadn’t! The remaining letters were ESNRDUP plus either L or S, ie a jumble of PLUNDERS… yes, it needed an L, so TOSE was the entry, not TOLE. Well that didn’t really help me: two teas and ‘plunders’. I had seen DARTMOUTH lurking in row 4 of the grid, and the BEE-EATERS at 34ac were awfully like ‘beefeaters’, and for some reason I thought of HMS Pinafore and Yeoman of the Guard by Gilbert and Sullivan. Unfortunately the first was set off Portsmouth, and the second in the Tower of London. 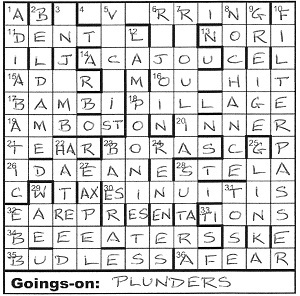 Before looking to see whether there were any other words hidden in the grid, I looked up bun fight in Chambers. Voilà! ‘(inf) a tea party’, and we were in Boston Harbour, 1773. A little bit of research revealed that the three ships involved were the Dartmouth, the Beaver and Eleanor. The latter two were to be found in rows 1 and 2 respectively. The whole shebang was because the colonists objected to the Tea Act of 1773, which they believed violated their right to ‘no taxation without representation’. Here, we had to move every instance of certain letters ‘thematically’ from these names (the ships) to share a cell with another letter. Well the letters were obviously those of TEA, and ‘thematically’ meant ‘overboard’, ie vertically downwards… to the bottom of BOSTON HARBOR (rows 6 and 7), where TXS and RPRSNTION became TAXES and REPRESENTATION, the two things that were linked. (e) Well done those who put the A from DARTMOUTH alongside the T of TAXES, and the A from BEAVER alongside the R of HARBOR, and having read and believed the preamble, counted the number of resulting non-words, and realised that they needed to be in group (b) above. Luckily I fell into group (e), having started off flirting with group (d)! Thanks, Kea. This entry was posted on 3 January 2014 at 5:00 pm	and is filed under Solving Blogs. You can follow any responses to this entry through the RSS 2.0 feed. You can leave a response, or trackback from your own site.